That’s because driving at 100 miles an hour (or 70 if you’re ‘normal’) on the motorway you need to know which lane to take in order to get to Heathrow. You don’t, as a rule, want to stare in wonder at the lack of ornaments on the Sans-Serif font that’s been used in a motorway sign, appreciating its legibility as you plough your car into a wall. Good Information design should never be noticed for its design treatment. You are however aware of Info-design’s older, louder and simplistic sibling, advertising/display design. And by advertising I don’t just mean television commercials, double-spread newspaper ads and those annoying Flash banners. I am talking about SHOUTY branding, loud in your face slogans, logos, icons and buttons. I’m talking about propaganda; I am talking about those that must be noticed in the context of design even if its meaning is superficial. Nike trainers won’t make you run faster even if the Swoosh logo is the name and symbol of the Greek Goddess of victory. Special K won’t make you slimmer even if the picture on the cover says so and incidentally it contains more calories than Frosties. Which is GRREEEAAAAT. Or not. And that’s the point of advertising; you see it and remember it by the way it’s presented/designed. The real information is a side issue. See pack for details. Advertising is disposable but the underlying slogan or image remains in the conscious be it a “Ba Da Ba Da Da! I’m loving it!” theme tune, a cartoon character or even BLOCK CAPITALS. Even the web has advertising/display design. No, again not the banner ads, I’m talking about Web 2.0. Web 2.0, born in 1999, was originally meant to be user centric as most sites at the time, especially search engines, had become portals which were difficult to navigate. This was then followed by flawed concepts such as the 7-links-per-page and Three-Click Rule. The idea was to give the user their content as quickly as possible. Click me, buy me and download here. Big shinny gradient filled buttons three times the size of the actual text whose sole purpose is to highlight actions with minimal explanation. And that’s fantastic if we are designing an e-commerce site like Amazon or Apple as the user experience is simple and disposable. You won’t remember what the site looked like nor will you care so long as the experience of placing your order was easy and your product arrives. You might remember the logo but that’s it. No learning curve. Compare that with an information design application such as Adobe Photoshop. This is an incredibly difficult program to learn, let alone master. But the Devil is in the detail. The UI is complex yet the design is simple. Take the tool bar for instance; there is a reason why the first two icons (marquee and arrow) sole purpose is to select something. We read left to right so the UI has been designed the most fundamental tools on the far left dropping in importance as you move towards the right. The same can be said for Microsoft Word although recent incarnations have veered towards an advertising/display big buttons look which has in turn confused their user base. Sadly Information design is often depicted as boring. Take Highway/motorway signs. They are incredible important and if designed correctly will help us navigate a complex hub. In the United States where a 5th of all drivers are elderly and/or have poor eyesight, badly designed signs have been responsible for traffic of accidents during sunset and sunrise due to halation, an effect where the shine of bright headlights on highly reflective material can turn text into a glowing, blurry mess. In 1989 graphic designer Donald Meeker and typographer James Montalbano decided to create a typeface designed solely for legibility during halation as they were convinced that the problem with the signs was the typeface not just the material they were printed on or their placement or size. 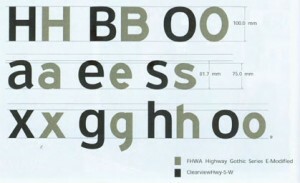 Over the course of 10 years they created a new font called ClearviewHwy which resulted in 20% increased legibility, potentially saving lives and has since been adopted by American Federal Highway Administration to be pushed out to all road signage in the US. AT&T were so impressed by its legibility the font that they also adopted in all of their advertising and marketing material in 2006. Some interesting points, I like the final line because it’s soo true!